Iraq is stumbling into its worst constitutional crisis since the end of the dictatorship of Saddam in 2003. The KRG’s headlong rush towards independence challenges the very roots of Iraq’s existence as a unitary state. The Iraqi prime minister Hayder Abadi and his government are trying to head off a Kurdistan breakaway, and have pursued strong-arm tactics that are likely to backfire when the area votes in the referendum on Monday. 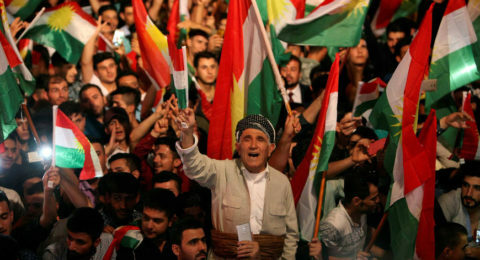 The South of Kurdistan, which has comprised more than 40% of the territory of Iraq, has long nurtured the dream of independence. It is the first autonomous region in Iraq since 1974 but its previous experience of autonomy failed to meet the aspirations of the Kurdish nation. That was the main reason for the continuous struggle in the area against all the Iraqi governments that came to power one after another. Kurdistan suffered greatly under Saddam’s long and oppressive rule. Kurds were prominent among the tens of thousands that perished under his regime. The sense of tragedy this engendered now stokes the referendum campaign. Although Kurdistan once again has a degree of autonomy in Iraq, the area has been effectively autonomous since 1991 when the Iraqi dictator lost control of the area. However, autonomy has resolved nothing. South of Kurdistan has become one of Iraq’s wealthiest regions and, in the period following the fall of Saddam, it contributed substantially to the post-war rebuilding of Iraq while receiving only 17% of Baghdad’s budget. Kurdistan was neglected and constrained by the former Iraqi dictators and currently by the Shia central government. The previous regime caused billions of dollars damage to the land and people of Kurdistan and the new Iraqi government has never accepted liability for this, partly because Iraq is still paying for causing the destruction of Kuwait in 1991. The Iraqi government should accept reality and allow the referendum to go ahead peacefully without any intimidation. The Iraqi state should accept that a people want independence and prepare for peaceful coexistence. The people of Kurdistan understand the benefits of having a separate state. The polls are showing that a large majority of 82% favour the referendum and independence. The Iraqi government should respect the will and right to self-determination of the people of Kurdistan.